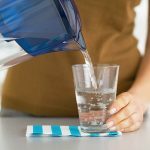 How To Make Mineral Water At Home? It is important for you to understand that mineral water is different from filtered water. While filtered water is just free of dirt and bacteria, mineral water is pure and rich in life supporting minerals like calcium, magnesium, sodium and potassium. People might contradict that it is practically not possible to afford expensive cans of mineral water on a daily basis. And practically, this is a valid contradiction too. However, mineral water can be prepared in your home itself. And these 5 simple steps will show you how! Filtering tap water is the first step to making mineral water at home. You can use your regular water purifier for this purpose. Take around 1 or 2 litres of tap water in a jar and transfer it to your water filter. Let the water get completely filtered. Once the water is purified, you need to transfer it into an open vessel. Make sure that the vessel is clean and free of any smell/odor. The next step to making mineral water at home is adding baking soda to the purified water. Add around 1/8thteaspoon of baking soda to 1 litre of purified water. Increase the amount to 1/4th of a teaspoon for 2 litres of purified water. Baking soda/sodium bicarbonate essentially adds sodium to water. This mineral cures certain health conditions like indigestion, constipation, bloating, heartburn and even arthritis. This is the first step of converting filtered water to mineral water. Once you add baking soda to purified water, add about 1/8th teaspoon of Epsom salt to 1 litre of filtered water treated with baking soda. Epsom Salt works like a disinfectant and keeps humans safe from bacterial attacks. Thus, it largely increases the purity of the already filtered water. The next step is to add potassium bicarbonate to the purified water that is treated with sodium bicarbonate and Epsom salt. Potassium bicarbonate maintains the blood pressure in humans. It is an essential mineral that maintains cardiac health and lessens the risk of heart attacks largely. Add around 1/8th teaspoon of potassium bicarbonate to the treated purified water to make mineral water. It is important that the ingredients added to the purified water be mixed well. You can use a soda siphon for the purpose of blending all the minerals well in purified water. Soda siphon is a gadget that is extensively used to disperse carbonated drinks. It comes with a cartridge and handle. Attach the cartridge with the siphon. Pass the water you made through the handle. Squeeze the handle as you pass water through it. Completely purified mineral water is what you get from the other end of the siphon. The above listed 5 steps are the simplest means that help you how to make homemade mineral water. It is rich in sodium and potassium. Have you ever prepared mineral water at your home before? Is it of the same taste and quality as that of the bottles you get in market? Do you know how is mineral water good for you? Do share your feedback with us in the comments section! What Are The Effects Of Using Hard Water On Hair? How Coconut Water Helps In Weight Loss?